Ah, sauerkraut. That delightfully pungent product of weeks (sometimes even months) of lacto-fermentation. People either love it or they hate it. For those in the former category, this post will serve as a fun adventure in variations on an old favorite. For those in the latter category, I venture to suggest you just haven’t met the right kind of sauerkraut recipe. I am one that loves sauerkraut in all of its forms, with the exception of the bland and processed types found in the grocery store (many of which are made with vinegar and canned, void of any probiotic or health benefits). When I first started making this gut friendly and tasty delight, basic is what I started out with. After all, I was new to lacto-fermentation and I wanted to make sure my concoctions didn’t taste “off”. After gaining some confidence however, I quickly ventured off to other flavors and add-ins. It keeps it interesting! I am one that loves sauerkraut in all of its forms, with the exception of the bland and processed types found in the grocery store. These homemade sauerkraut recipes are perfect. *These contain tannins, which keep the kraut crunchy. I would not recommend skipping these, nothing is worse than mushy kraut! Chop or grate cabbage, fine or coarse depending on how you like it. Place chopped cabbage in a large bowl, sprinkling with salt as you go. The salt helps to pull the juices from the cabbage, creating the brine. It also helps keep the cabbage crunchy. Give cabbage a good mix and pack it a bit at a time into a ceramic crock or fermenting jar. As you go tamp the salted cabbage down forcefully with either your fist or a sturdy kitchen gadget (I use the top part of a wooden meat tenderizer). This packs the cabbage tight and pounds out the juices for the brine. Make sure the cabbage is submerged to prevent mold. I usually add about an ounce or two of leftover brine from a previous vegetable ferment as a starter, but it is not necessary. Then use a ceramic plate, sterilized rocks or other weight to keep the cabbage down. Seal the crock or jar, and voila! You are on your way to some delicious kraut! Wait anywhere from a couple of weeks to even a few months, tasting until you get a flavor you like. If the sauerkraut dries out a bit and the liquid level is low, you can add some brine made with 1 Tbsp salt and 1 cup water to keep cabbage submerged. Now for the fun part, the variations!! To the basic recipe, add the juice of 3-5 lemons, 4-7 whole or chopped cloves of garlic, and a handful of fresh dill or 1 Tbsp dill seeds. It is not an exact science, add as much or as little as you like! To the basic recipe, add 1-2 whole or sliced apples and 1-2 Tbsp juniper berries. To basic recipe, add 1-3 Tbsp caraway seeds. Yes, broccoli leaves are tasty and nutritious! And downright delightful in a kraut. In place of about ⅓ of the cabbage in the basic recipe, substitute shredded broccoli leaves. Add about ½ -whole of a medium onion and some red pepper flakes, more or less depending on your spice tolerance. 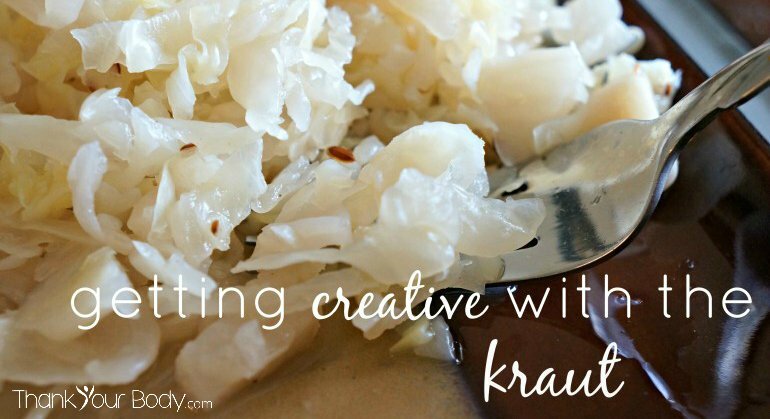 This is a refreshing and lighter kraut. To the basic recipe, add the juice of 3-5 lemons and a couple knobs of sliced, fresh ginger. Other add-ins include carrots, celery, seaweed, greens, brussel sprouts, beets, turnips, daikon radish, jalapeños/spicy peppers, burdock roots, celery seeds, sumac, cumin, coriander, etc. etc. The sky is the limit, there really is no wrong answer! Also, be sure to check out this post on how to make your own naturally fermented sauerkraut. Do you have any favorite variations of sauerkraut recipes you have tried or made?